Popup Builder has been released yesterday, and it's already featured on Product Hunt! Earlier this morning, our long anticipated Popup Builder has been launched on Product Hunt. 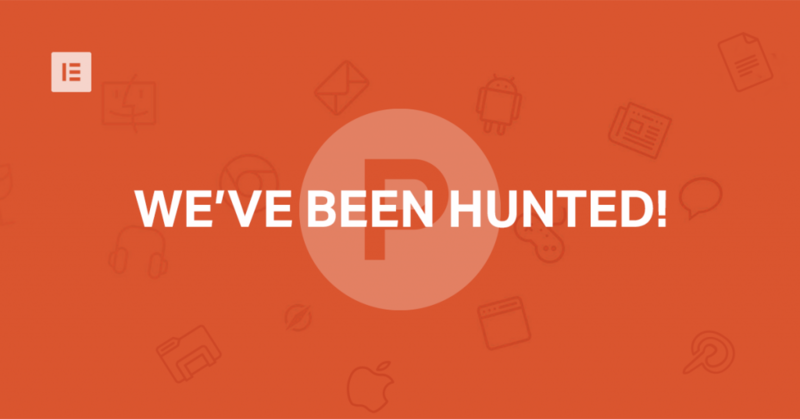 This is the third time that Elementor is “hunted” on PH, and we are thrilled about it, as we firmly believe that Elementor Popups is a game changer for web designers and marketers. For those of you who are not yet familiar with Product Hunt, this is THE website to get your product out there – whether it’s apps, games, hardware projects, or podcasts. It lets users, called hunters, share the new products they had discovered to other users. The products that get the most votes of the day rise to the top. Products on the website are arranged in four categories; technology products (web apps, mobile apps, hardware products, etc. ), games (PC, web, mobile apps), books and podcasts. We launched two and a half years ago in Product Hunt, and have since grown to be the leading design tool for WordPress, with almost 2 million active installs. Our team has grown from 6 to 60. Being featured on Product Hunt back when we launched gave us a nice boost and exposure when we were just starting out. We were actually hunted without our knowing it, so the whole thing caught us by surprise. As for this current hunt, we are thrilled to be hunted, since we consider the Popup Builder a big deal for WordPress marketers, designers and web creators alike. Designing popups should ideally be handled in one place. You use the same Elementor builder you know and love. You can include all your content from Elementor, WordPress, WooCommerce, ACF and more. You have advanced targeting capabilities that are set up intuitively from inside Elementor. You get the highest level of design and styling options available in Elementor, including the ability to use all widgets. We’ve prepared over 100 pre-designed templates. I invite you to visit Product Hunt, and ask us anything about this release. Thanks for the information about Product Hunt. Actually this is really great news and great addition to Elementor. This kind of stuff flames out extremely quickly, and the market isn’t large enough to turn it into even a 1 man blog that you can quit your job with. and forget about ad-based revenue.